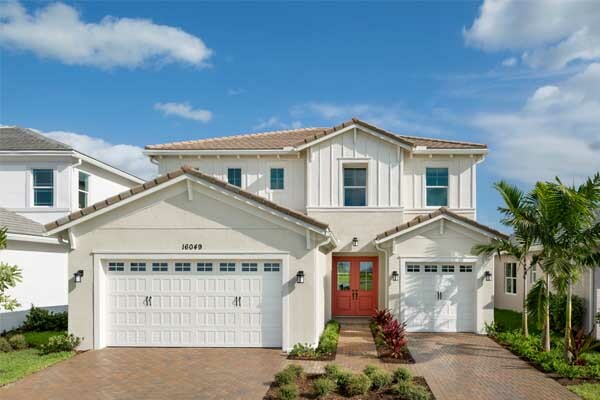 CITY OF WESTLAKE, Fla. – (February 22, 2018) – Minto Communities announced it will host its first Showcase of Homes, a two-week-long special presentation of model homes at its new master-planned community, Westlake. From February 24 - March 11, the public is invited to tour the designer homes and vote on which models feature their favorite kitchen, master bathroom, outdoor living area, floor plan, living room, master bedroom and interior design. There is also a category for the favorite overall model. After the voting period ends, Minto will announce the results. The Showcase of Homes will be open to the public Monday through Saturday from 10 a.m. to 6 p.m. and on Sunday from 12 p.m. to 6 p.m. Eligible participants will be entered for an opportunity to win a 7-day Caribbean cruise for two. The models are all located in the Hammocks, the first neighborhood under construction in Westlake. Once completed, it will have a total of 325 one-and two-story single-family homes from two unique collections, with prices starting in the high $200s-mid $500s. The Cypress Collection homes will be built on 50-foot home sites consisting of 14 unique floorplans ranging from 1,483 to 4,025 square feet under air. The residences offer 2-5 bedrooms and 2-5 bathrooms, and 2-3 car garages. The Indigo Collection features larger single-family homes designed for 65-foot homes sites. There are 11 floorplans ranging in size from 2,410 to 4,320 square feet under air. This collection offers between 2 and 6 bedrooms, 2.5-4.5 bathrooms and 2-3 car garages. Minto held a successful grand opening for the 3,800-acre master-planned community of Westlake in October 2017. Plans call for a total of 4,500 homes and more than 2 million square feet of non-residential development. Westlake’s resort-style amenities include an aquatics center with a lagoon-style pool, tower slide and splash pad, plus an adult pool with swim lanes and shade cabanas. Expansive recreational lawns offer spaces for picnics, lawn games and events. Additional planned amenities include an adventure playground, dog park, sports courts, outdoor concert pavilion, pump park, and multi-purpose building. The community’s Town Center will be a focal point for residents; a comprehensive retail district with an eclectic blend of national and local retailers, wide sidewalks and public spaces that host a lively calendar of programming and events. Westlake offers a program through which qualified buyers can purchase a home for just 3 percent down. In addition, the Welcome Heroes program provides a 3 percent discount off the base purchase price of a new Minto home for public servants such as police officers, firefighters, military, teachers, healthcare and nurses. Westlake is located at 16610 Town Center Parkway North in the City of Westlake on Seminole Pratt Whitney Road between Southern Blvd. and Northlake Blvd. For more information on the community or the Showcase of Homes, call 888-299-3628 or visit www.WestlakeShowcase.com. From the Cypress Collection, the 2,584 square foot Azalea model offers 3 bedrooms plus loft, 2.5 bathrooms, open island kitchen and 3-car garage. In addition to the impressive kitchen, the Indigo Collection's Kestrel Grand model features 5 bedrooms plus den, 4.5 bathrooms and covered lanai for a spacious 3,977 square feet of living space.